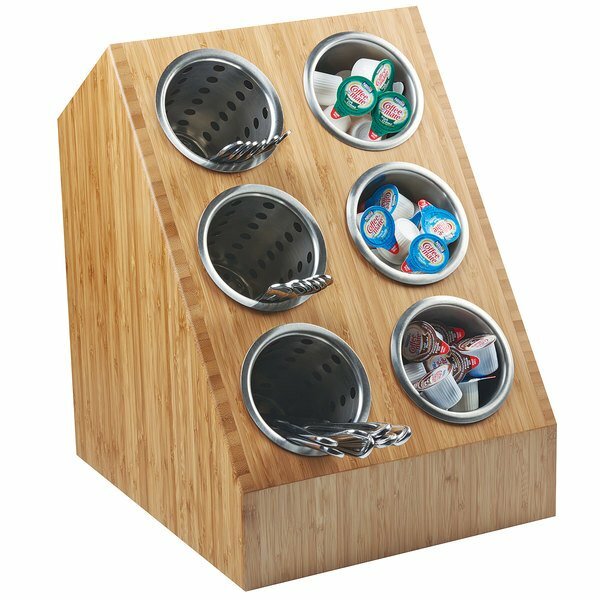 Keep your clean forks, knives, and spoons organized with this Cal-Mil 1426-60 6 compartment bamboo vertical cylinder flatware / condiment holder! Boasting a slim design that's great for tight spaces, this holder makes it easy for guests to grab silverware at buffets or events where table service isn't available. Plus, its slanted surface provides optimal visibility and allows you to easily see which compartment each type of utensil is in. Made of gorgeous bamboo, this holder adds a natural look that's sure to brighten your bar, diner, cafe, or coffee shop. It's also versatile and can be used to hold creamers or other condiments when paired with solid cylinders. Ensure your flatware is sorted and organized by using this convenient, stylish holder!